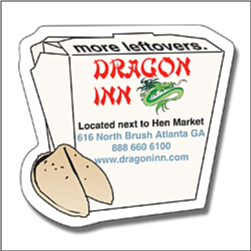 Order Custom Chinese Food Box Magnets – perfect for marketing a chinese restaurant and take out food service. Magnets approx. 2.75inches x 2.65inches. Put your business information right in front of your customers as they go to open the refridgerator. Magnets available in many other shapes as well as custom shapes to fit your logo. Order custom food box shaped magents today!